Check out the new beginnings of the R.T.G.S.A. The Robert Taylor* Graduate School of Architecture. Click the link located in the menu bar and transform your career for the better. 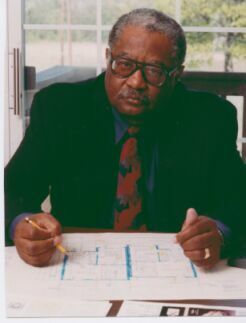 "The African-American architect does not now register on the most important and authoritative gauges of economic development that are watched regularly by African-Americans...Conversely, and most tellingly, the image of the black architect on the African-American cultural front is now confirmed as, at best, nonexistent. The recently released Africana Encyclopedia compiled by Harvard based Henry Louis Gates and Ghanaian philosopher-scholar Kwame Appiah is now the definitive catalogue of the culture of the African and African-American Diaspora." "There are over 2,000 pages packed with nearly countless numbers of cultural figures from the worlds of music and the arts. And not a single architect is listed..."
To inform, educate, and most importantly, enlighten Black America and her up and coming young black architects about the deep-rooted crisis in orthodox architecture. Melvin Mitchell's book focuses on this subject by detailing the many opportunities black folks had during the golden years of the Harlem Renaissance and later on during the 20th century. 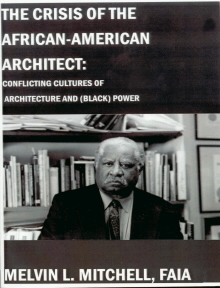 Black folks in the area of study of architecture and other humanity of culture must take notice of these issues raised by Mr. Mitchell. I ask all to take a tour around his website to receive this powerful and meaningful message of this crisis. If you wish to purchase his book just click the book icon above at iUniverse for your convenience or at the other popular literary outlets. Ask questions, comments or state any related information regarding the issue Melvin Mitchell has raised. "Architecture is different from math and the hard sciences is about culture."